Review: 2013-06-01, some good exchange but it is not enough to get three stars. 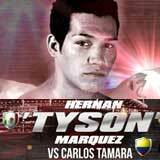 Hernan ‘Tyson’ Marquez (35-3-0, 26 KOs) entered as the No.7 flyweight in the world while Carlos Tamara (23-7-1, 17 KOs) entered as the No.44. Marquez vs Tamara is the main event of the evening (WBO flyweight title eliminator). Watch the video!